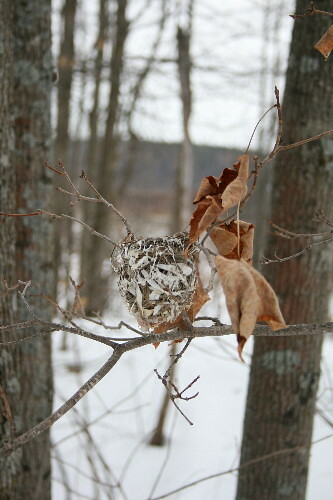 I love the magic and mystery of discovering birds’ nests during the winter that you must have walked by a dozen times or more during the summer but never knew were there. In this case, I probably walked by this one half a dozen time, at least, even since the leaves came down, and still never spotted it. It’s strange how something so large and, once you know it’s there, so obvious can blend in so well to its background if you’re not looking for it. Not only well-camouflaged in the summer, but through the bare winter months, too. 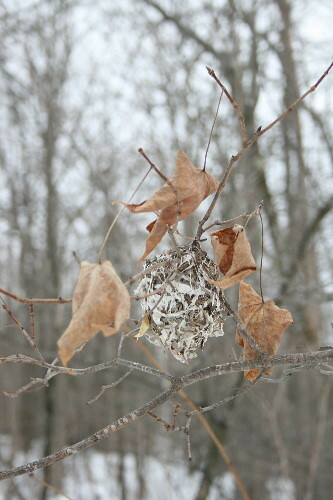 I found this nest alongside the rail trail on a recent walk down there. 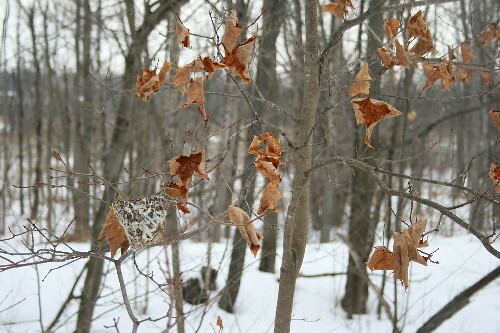 It was only a few feet from the trail, and one would think the colour in the dead leaves would have drawn my eye to its tree, but it never did. One might also have considered the trail’s edge to be an odd place for a nest, given the regular disturbance it would receive, but I find a surprising number of them in close proximity to it. Ease of access? In any case, even on the “busy” summer weekends I’ve yet to see many people using it. I rarely encounter anyone else at all while out walking, and when I do it’s usually just one individual or group. This one belonged to a Red-eyed Vireo. There are six vireo species that nest in Ontario, though one of them only reaches the very southern parts of the province. All of them build nests of a similar style: instead of resting on the branch, the cup is suspended between the two branches of a fork, the threads deftly woven around each twig. While we do have a few species of vireo in our area, a couple of clues tell me that this was made by a Red-eye. First is the habitat, which is mixed-deciduous woods, and the landscape, which is moderately disturbed. Warbling Vireos prefer riparian habitats; Blue-headed like a strong coniferous component; and Yellow-throated like primarily deciduous. Red-eyed and Warbling are also a lot more tolerant of disturbance in the landscape than the other species, which like more uniform tracts of forest. And the second clue is in the materials used in the nest’s construction. This one has so much birch bark woven through it that it’s nearly white. While all of the vireos might include a little bit of birch bark, usually only the Red-eyed ever uses so much (though it should be noted that not all Red-eyes will use this much). A third is the height of the nest: Red-eyed Vireos often use younger trees, and so are necessarily lower to the ground than the other species usually are. A couple of years ago, just before we moved from the lake house, a Red-eyed Vireo began building its nest in a small tree half a dozen feet from our living room window. It took her (only the female builds) about four days to complete. Dan captured some of it with his video camera and compiled it into a video. It’s pretty neat, especially to watch the bird snuggle in and make sure it’s a good fit. What a wonderful post and video! I am constantly amazed by the ingenuity of birds. Love the post- I love finding things in plain sight that I hadn’t noticed until my “a-ha!” moment. What a treat your posts are; thank you! Around here, I find oriole nests…in the same way. Fun, isn’t it! The video is really wonderful. I’m going to return to it many times. Thanks! Thanks, all! We definitely don’t give birds enough credit.